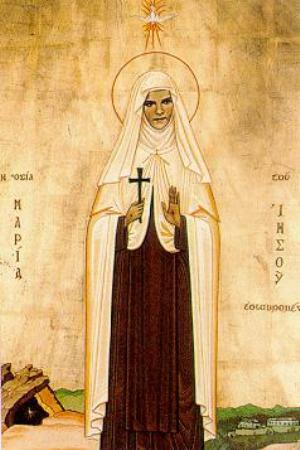 Saint Mariam Baouardy (also spelled Mariam Bawardy) is known in religion as St Mariam of Jesus Crucified, was born in Ibillin, located in the hill country of upper Galilee, Palestine. Her family originated in Damascus, Syria. They were Catholics of the Melkite Greek-Catholic Rite, descendants of the Archeparchy of Antioch, the place where the followers of Jesus were first called Christians. Her father, Giries (George) Baouardy, came from Horfesch, Palestine; her mother, Mariam Chahine, came from Tarshish, Palestine. The birth of Mariam in 1846 came after many tears and much prayer by her parents Giries and Mariam Baouardy. Prior to Mariam they had had twelve sons born to them, and sadly all had died in infancy. Their grief was immense at the loss of all twelve of their children. Broken-hearted, but full of hope, the mother had an inspiration that she confided to her husband: "Let us go to Bethlehem on foot, and ask the Blessed Virgin for a daughter. Let us promise Her that if our prayers are answered, we will name her Mariam and will offer for the service of God a quantity of wax equal to her weight when she is three years of age." Full of confidence, the husband and wife left for Bethlehem, at that time a very long trip of 170 kilometers, which they made on foot.. We can guess their hope and fervor as they prayed at the Grotto of the Nativity, where the Mother of God blessed them by grating their request. The parents were overjoyed when their prayers were answered and Mariam was born to them on the eve of the Epiphany, January 5, 1846, and as promised they then named her after the Virgin Mary, in whom they had a great devotion. Ten days later in the local Melkite Catholic Church in her hometown of Ibillin she received Baptism, Confirmation and the Eucharist. A few years later Mariam would be joined by a little brother named Boulos (Paul), but this joy was to be short-lived as both of little Mariam's parents died. When Mariam was only two years old both her mother and father died within a few days of each other of an unspecified disease.. An aunt later related to Mariam her father`s last words. Thet were concerning his beloved daughter Miriam. Looking at a picture of St. Joseph, he had murmured: "Great saint, here is my child; the blessed Virgin is her mother; deign to look after her also; be her Father." A maternal aunt, living in Tarshish, took her younger brother Boulos into her home; as for Mariam, she was adopted by a paternal uncle in her hometown of Ibillin. The brother and sister were never to see each other again. Mariam received every care and attention in her uncle`s home, where the situation was one of comfort. But how could she forget that she was an orphan? The loss of her parents left their mark on her. a clear voice, “This is how everything passes. If you will give me your heart, I shall always remain with you.” These words penetrated and took root in the young heart of Mariam. Later in a “dream” that she was always to remember, she saw a merchant come into her uncle`s house and offer a fine big fish for sale. She understood that the fish was poisoned, then she woke up. "It was only a dream!" she told herself. But in the morning a man did present himself to sell a fish just like the one in her dream. She warned her uncle, who nevertheless stubbornly persisted in waiting to buy the fish. Mariam wept and insisted that her uncle not eat the fish, and since her would not give in she insisted that she should take the first bite, happy to sacrifice herself for the others. In the face of her persistence, her uncle and aunt finally opened the fish, and to their great astonsishment and surprise the fish was indeed poisoned, as it had swallowed a small poisionous snake! On another occasion somehow a snake managed to get into the house and came into the room as she was eating by herself. Unafraid, she picked it up, and just then a servant opened the door,and seeing the snake and the child, he screamed. Surprised, Mariam let go of her hold and the snake escaped, while the rest of the family came in running because of the servants scream. The snake incidents seemed to be a precursor to her future mystical battles against evil. During her life, Mariam often had a visions of snakes, and later her very life as a Carmelite and a Mystic was to be a fierce battle against "the ancient Serpent", who is called the Devil or Satan, the seducer of the whole world, (Apoc. 12, 9.). But like the Woman of the Apocalypse, she would emerge victorious. The Blessed Virgin was to surround with much tenderness this young girl whose parents had asked for her at the grotto of Bethlehem. Mariam was to be the privileged child of Our Lady. In Her honour, from the age of five, she fasted every Saturday, taking only the evening meal to the great admiration and edification of her aunt and uncle, who were continually in amazement by the devotion of such a young child. In the springtime she would gather flowers choosing the loveliest and most fragrant from the garden or on the hills of Ibillin to place before the icon of the Blessed Virgin. And what was not her surprise one day to find that the cut flowers had taken root in the vase? She showed her uncle who, in turn informed the local pastor. In an effort to keep her humble, he scolded her as though her sins were responsible for this phenomenon. Mariam fell on her knees, humbled herself and asked pardon for her sins. "What do you think will become of this child?" wondered the pastor, the relatives, and the neighbours at the sight of such spiritual piety and devotion from a five year old child. When Mariam was 8 years old her uncle moved his family to Alexandria, Egypt, and once again Mariam was saddened to leave her home which she had come to love. Mariam was quickly learning to understand how fleeting the happiness of this world was, as suffering and loss seemed to follow after her. She was not to see her beloved Abillin until shortly before her death in 1878. In the morning Mariam informed her Uncle that she would not marry. Her first tried to reason with her, explaining the material advantages and benefits of the prearranged marriage. Her adoptive uncle then flew into a wild rage when he saw that Mariam would not marry, but would remain a virgin. The uncle then beat Mariam and screamed his rage at her insubordination and disobedience to his order. This did not change Mariam’s mind as she withstood the beatings and insults hurled at her by her uncle. Mariams heart was deeply saddened that she had upset her uncle, but she stood firm in her resolve, for her love for God was greater than anything else. In punishment, her uncle then resorted to have her treated as the lowest household servant, giving her the most difficult kitchen tasks, and subjecting her to a position lower than his hired help. Mariam sank into a deep sense of desolation and desperation. In her suffering she turned to her younger brother, Boulos. She wrote a letter to her brother inviting him to come and see her in Alexandria. “A nun dressed in blue picked me up and stitched my throat wound. This happened in a grotto somewhere. I then found myself in heaven with the Blessed Virgin, the angels and the saints. They treated me with great kindness. In their company were my parents. I saw the brilliant throne of the Most Holy Trinity and Jesus Christ in His humanity. There was no sun, no lamp, but everything was bright with light. Someone spoke to me. They said that I was a virgin, but that my book was not finished. " She then found herself once again in the grotto with the “nun dressed in blue”. How long did Mariam remain in this secret shelter? She later spoke of one month, but she was not sure. One day, the unknown nurse prepared some soup for her that was so delicious that she greedily asked for more, and all her life she was to remember the taste of this heavenly soup. On her death bed she was heard to say tenderly, "She made me some soup! Oh, such good soup! There I was a long time, looking, and never ate soup like that. I have the taste in my mouth. She promised me that at my last hour, she will give me a little spoonful of it." Toward the end of her sojourn in the grotto, the nurse in blue outlined for Mariam her life`s program, "You will never see your family again, you will go to France, where you will become a religious. You will be a child of St. Joseph before becoming a daughter of St. Teresa. You will receive the habit of Carmel in one house, you will make your profession in a second, and you will die in a third, at Bethlehem." "A celebrated doctor at Marseille, who had taken care of Mariam, had confessed that, although he was an atheist, there must be a God, for from a natural point of view, she could not have lived." As a result of this deep cut Mariam`s voice was always hoarse. The martyrdom of the little Arab had not been a dream, it remained inscribed in her flesh. Once again, in August 1875, when she was on a boat going toward Palestine, she recounted what she remembered to her director, Father Estrate, and she stated precisely, "I know now that the religious who cared for me after my martyrdom was the Blessed Virgin." Mariam never saw her aunt and uncle again. They knew nothing of the tragedy and they thought that Mariam had run away to escape the ill treatment and to perhaps to become a nun. They had every interest in keeping silence about their adopted child, as she could only bring them dishonor by her refusal to marriage. She was only thirteen and was now on her own. At first she supported herself by working as a domestic servant. An Arab Christian family named Najjar hired her to work for them. They gave her food, room and a small salary.. She lived as one of the poor, with just one dress, and her salary was given to the poor, except for a few piastres to provide oil for the little lamp that burned before an icon of the Blessed Virgin. Her spare time she devoted to the less fortunate. One day in the streets of Jerusalem, a young man, very handsome, and with an air of sincerity, came up to her and began a conversation. She was fifteen years of age. The conversation was one of great delicacy, the young man spoke to her in praise of perfect chastity. Some days later he met her again, said his name was John George, and offered to show her the way to the Holy Sepulchre. Having arrived at the holy place, she promised her mysterious guide that would take a perpetual vow of virginity if he would do the same. And thus it was that at the sacred edifice, on the very place of the glorious tomb of the risen Lord Jesus, these two young people became "children of the Resurrection" by pronouncing the definitive vow of chastity. Before taking leave of Mariam, John George recalled to her the main stages of her life as the Blessed Virgin had sketched them for her in the grotto of Alexandria. Ten years later at Mangalore, India, Mariam was to see her "spiritual brother" again, this was shortly before her perpetual profession in Carmel. The young religious then understood that John George was an angel that the Lord had sent her, to help guide her, as he had in former days to the young Tobias. After her stay in Jeruselem, Mariam returned to Jaffa to go from there to Saint Jean d`Acre, however the boat she was travelling was forced by inclement weather to change direction and to port in Beirut. Feeling it was perhaps the will of God, she once again took up an occupation as a household servant. Two exceptional facts stand out during this period. She had been working for scarcely six months when suddenly she was struck with total blindness. This lasted for forty days. Once again Mariam turned to the Blessed Virgin, "See, my Mother," she said, "all the trouble that I am causing in this house. I was not even better cared for by my parents. Oh, if it would please you and your divine Son, give me back my sight!" Immediately something fell from her eyes and they opened, and she could then once again see. A couple of months after that she suffered a tragic fall when she was hanging clothes on the terrace. At first the family win whom she was working for thought she was dead; her bones seemed to be badly broken and crushed, and the doctors gave no hope of recovery. Her employers cared for her as for their own child. A month later, in front of her little night lamp that she kept burning before a statue of the Blessed Virgin Mary, she saw - as did Therese of the Child Jesus later on - the Blessed Virgin smile at her, recommending three things to her, obedience, charity and confidence. A perfume and light filled the room. Mariam was cured, and she immediately became hungry. The family and neighbours came flocking in, and at the sight of the prodigy everyone, Christian and Moslem, went down on their knees, giving thanks and proclaiming God`s miracle through the Virgin Mary. 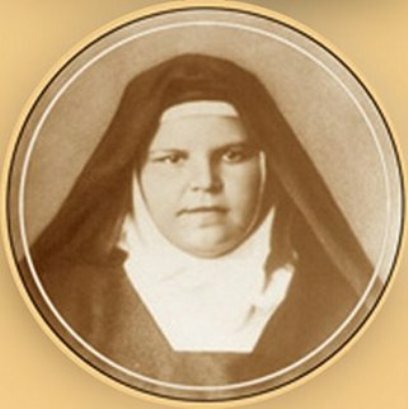 These facts were later confirmed in a letter in 1869, when the prioress of the Carmel of Pau where Mariam was then a sister, wrote to Sister Gélas, the superior of the Daughters of Charity of Beirut, asking her to verify the accuracy of these facts, and the superior confirmed that the events had happened exactly as stated, and even added some further details. At age eighteen, circumstances led her to leave Lebanon for Marseille, France at the beginning of May, 1863. There she became a cook for an Arab woman named Madame Naggiar. Each morning Mariam usually went either to the church of St. Charles or to the church of St. Nicholas, the latter being of the Greek Catholic rite, which was her rite. In this church she once again enjoyed the sumptuous ceremonies of the confessor she chose Father Philip Abdou, the rector of the church, a Lebanese. During one of her first communions there, she was rapt in a wonderful ecstasy. Her mistress, when informed of it, came for her in her carriage. The phenomenon lasted for four days, and the doctors did not know what to make of it. Mariam acknowledged later that she had gone through heaven, hell and purgatory. While in ecstasy she received the order to fast for one year on bread and water to expiate the sins of gluttony in the world, and to wear poor clothing to expiate the sins of immodesty and luxury. "I know that you want to enter the convent and I will follow you until you are in the convent." From that moment onward, Mariam felt herself called to the religious life. Who was this stranger? The young girl had no doubt that it was St. Joseph. In her efforts to follow her vocation, Father Abdou was of great help to her. But, as always in her life, the stages were many and laborious. The young Palestinian went first to the Daughters of Charity and applied to enter. Forestalled by Madame Naggiar, who did not want at any price to be deprived of her cook, they refused under the pretext that she was a servant. Mariam then went to see the Poor Clares, whose style of poverty and silence appealed to her immediately. But her delicate health did not allow her to enter the cloister, she had been so greatly weakened by her fast that she had been given the sacrament of the sick. But once again, rapidly and contrary to all expectations, she found herself cured. She made a fresh attempt, at the Sisters of St. Joseph of the Apparition, founded by Emily de Vialar. For was it not St Joseph who had appeared to her repeatedly in the street encouraging her to become a nun! The motherhouse and novitiate were located at "the Capelette" in the suburbs of Marseille. The little Palestinian could neither read nor write, and she spoke only Arabic. She was accepted, however, because the novitiate in fact had a few Palestinians among its numbers, and the Congregation had several communities in the East, especially in the Holy Land. Upon entering she was familiarly called “Mariam the Arab”, or ”the little Arab”. She remained a postulant for two years. Thus the first part of the vocation that had been given to her by the Blessed Virgin had been realized, for she was now a daughter of St. Joseph. Her fellow sisters were always amused by her broken French, but they were most impressed by her remarkable virtues and piety. Fortuneately for Mariam, two women of great virtue were directing the Capelette at that time, the Superior General, Mother Emily Julien, and Mistress of novices, Mother Honorine Piques. They were excellent spiritual guides for Mariam and to their surprise they soon began to notice some strange phenomena in little Arab. The ecstasies of the church of St. Nicholas were multiplied, with some disturbing peculiarities. Thus it happened that in January 1866 - the postulant was twenty years of age - Mother Honorine came upon Mariam in the dormitory, prostrate, with her face to the floor and her left hand covered with blood. From Wednesday evening to Friday morning each week, to the ecstasies there soon was added another remarkable phenomenon, the stigmata. The stigmata of the heart was the first to be manifested. She was twenty years of age, and it happened in August, 1866 at Marseille. She was praying in the chapel one evening, when, in the tabernacle she saw Jesus, who appeared to her with His five wounds and the crown of thorns. It seemed to her she saw coals of wrath in His hands. She heard Jesus say to His Mother prostrate at His feet: "Oh, how My Father is offended!" The little postulant then sprang toward Jesus, she put her hand on the wound of His Heart, exclaiming: "My God, give me, please, all these sufferings, but have mercy on sinners." Coming out of the ecstasy, she saw her hand covered with blood, and she experienced a severe pain in her left side: the latter would bleed every Friday. "It seemed to me that I was gathering roses to decorate Mary´s altar: these roses appeared to have thorns on both sides, and the thorns were thrust in my hands and into my feet. When I came to myself, my mouth was very bitter, my feet and hands swollen: in the middle of my hands and on my feet there were black bumps." The following day, Thursday, the sufferings continued to increase until Friday. It was the Feast of the five wounds of Christ. In the morning, about ten o'clock, the black scabs fell off, the crown of thorns appeared on her forehead, blood flowed from her head and feet. The prodigy was renewed during the months of April and the first two weeks of May. It ceased upon an order of the mistress of novices. This latter, in order to put an end to the rumors that were circulating in the community, asked the postulant to obtain from God that nothing would appear exteriorly. To the great joy of the stigmatist, the wounds closed and healed up. As may be imagined in such a large and diverse community, Mariam became an object of contradiction. While the majority of religious were favorable to her, there was a group of Sisters who were in opposition to her because of the extraordinary mystical graces that was receiving. For such is a common problem with mystics and victim souls who are called to religious life. After all, is such a person with such strange manifestations suitable for an active congregation? And then, with regard to such phenomena, were they authentic? The day came for the votation for admission to the novitiate. Of the seven eligible to vote, there were two abstentions, two in favour and three against. Mariam was not admitted! It was a hard blow, first of all for Mother Honorine, who had good reasons to believe in her manner of life. As for the Superior General who, absent at the time of the votation, declared later at her return that had she been present, that would never have happened. Later, on December 12, 1868, the Mother Superior wrote to the Prioress of the Carmel of Pau, "Our ecclesiastical superiors did not believe we should keep her in our midst, saying that a cloister was a better place to hide such souls. Our sisters obeyed. And so you now have this privileged soul. May God be praised for it!" Obviously the blow was hardest for Mariam. What was to become of her? Unknown to her the Holy Spirit was preparing the next course of action for her. 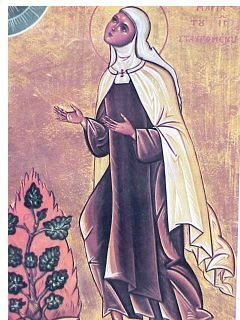 Mother Veronica, who had received from Rome the authorization to become a Carmelite nun and transfer to the Carmel of Pau, proposed to Mariam that she might introduce her to the Mother Prioress. Mariam agreed so Mother Veronica wrote and the reply was immediate and positive. In her letter of introduction, Mother Veronica had passed over in silence Mariam`s extraordinary mystical privileges, but she had added, "She will obey even miraculously." Having both gained admittance into the Carmelites, the two religious presented themselves at the door of the Carmel of Pau, France on Saturday, June 15, 1867. Mariam knew nothing at all of Carmel or of St. Teresa. But that day she understood that the mysterious words of her miraculous nurse at Alexandria were realized, "You will be a child of St. Joseph before becoming a daughter of St. Teresa". September 1875 - August 1878, Carmel of Bethlehem. In 1870 she went with the founding group to establish the Carmel of Mangalore in India. It was there in Mangalore that Sister Mary of Jesus Crucified made her profession. She returned to the Carmel of Pau, France in 1872. Three years later she went to the Holy Land where she built a monastery in Bethlehem and began the planning for another at Nazareth. Those who read her life discover that Myriam had experienced ecstasies all her life: from her early childhood, in the garden, in her home, and in the church of Ibillin; during the bloody night at Alexandria, at her employers in Beirut and Marseille. In the church of St. Nicholas she was rapt in an ecstasy that lasted four days. But it was especially from the time she entered religious life that the phenomena began to be intensified. At the Capelette, when she was with the Sisters of St. Joseph, she was found in ecstasy in the chapel, at recreation, and especially at night in the dormitory. After she entered Carmel, we note a crescendo, to the degree that at Mangalore the ecstasies occurred almost daily: she had as many as five a day. At Bethlehem, during her last years, they were still more frequent, but at the same time more serene and more painful. The ecstasies would sometimes occur suddenly, and at other times progressively. "There are times," she said, "when I can do absolutely nothing: no matter what I do to prevent it; and at other times I can distract myself a little in order not to go off." In fact she did struggle against the raptures. In her ignorance of mystical things she did not even suspect the privilege she enjoyed for she spoke of her ecstasies as “sleep” And how she fought against going to “sleep”! She begged Father Manaudas, her spiritual director, to forbid her to this sleep. "My child," the priest replied, "do not worry; you can go to sleep in all security." She began to cry. She made the same request to Bishop Lacroix, who ordered her to abandon herself to God instead of struggling against such a sleep. It was in fact a real struggle. In order to resist the rapture she moved around, she shook herself, she dashed to the fountain to wash herself, she worked more diligently. She even tried pricking her skin with pins, and in refectory she put burning hot food into her mouth. Nothing helped. To the mistress of novices, who asked her how she could easily go to sleep, she replied innocently: "I feel as though my heart is open; as though there was a wound in it; and when I have certain ideas and impressions of God which move me, it feels like someone touched the wound in my heart, and I fall in weakness, I lose myself." During her professions ceremony at Mangalore, November 21, 1871, it required an order of the prioress to awaken her so that she could pronounce the vow formula. On June 28, 1873, at Pau, the prioress went into the little one´s cell after the recitations of matins. The latter was seated before the open window: she was in ecstasy. She said to the mother prioress: "The whole world is asleep, and God so full of goodness, so great, so worthy of all praise, and hardly no one is thinking of Him! See, nature praises Him, the sky, the stars, the trees, the grass, everything praises Him, and man, who knowledge of His benefits, who ought to praise Him, sleeps! Let us go, let us go and wake up the universe!" She skipped out of her cell: "Let us go and praise God, and sing His praises. Everyone is sleeping, the whole world is asleep, let us go and wake them up. Jesus is not known, Jesus is not loved. He, so full of goodness, He who has done so much for man!" During her ecstasies, her body sometimes remained supple, but often it became rigid, remaining in the same position that it was at the beginning of the ecstasy. During this time, nothing and no one could make her move. It was impossible to have her sit or lay down, or to take her from her any object she was holding, or to lower her raised arm. Only obedience could overcome this immobility. She was also completely insensible to any external stimulus. Once, she injured her knee with a nail, which caused her much pain and she could not help but to limp when walking.due to the pain. Suddenly she was rapt in ecstasy, and remained for two hours on her knees. On another occasion, on November 30, 1874, she began to sing "in a clear and strong voice", although since her martyrdom her voice had been hoarse because of the fact that her neck was cut so severely. On January 7, 1875, a violent blow on the head resulted in one eye being injured. Mariam, "later being rapt in ecstasy", wrote the faithful secretary, "we brought a light near her injured eye, which we had not yet been able to examine due to her humility and also the pain caused when opening it. It was open, and although quite inflamed, it remained steady when we put the light in line with its gaze." "I am in God, and God is in me. I feel that all creatures, the trees, the flowers belong to God and also to me. I no longer have a will, it belongs to God. And all that is God´s is mine. "Only love can fill the heart of man. The just man is satisfied with love and a pinch of earth, but the wicked man, with all the pleasures, honors, riches (he can acquire), is always hungry, always thirsty. He is never satisfied. "Pay attention to little things. Everything is great before the Lord. The Lord does not want robbery in the sacrifice. Offer and give Him everything. "In heaven, the most beautiful souls are those that have sinned the most and repented. But they made use of their miseries like manure around the base of the tree." "Be very charitable; when one of your eyes sees what is not right, shut it and then open the other one! Change everything into good." "If you love your neighbor, it is by this that you will know if you love Jesus. Each time you look at your neighbor without seeing Jesus, you fall very low." We see in the lives of many mystic saints that an ecstatic, while in ecstasy, can be drawn a little above the ground through a supernatural and mysterious grace. However, Sister Mary of Jesus Crucified was one of the only ones, along with Saint Joseph of Cupertino, to make real flights. The phenomena was verified for the first time on June 22, 1873 in the garden of the Carmel of Pau. Noticing her absence at supper, the mistress of novices looked for her in vain in the cloister and the orchard, then another nun heard a song: "Love! Love!" She looked up and discovered Mariam balancing herself without support at the top of an enormous lime tree. Advised of this, the prioress arrived and confronted with this phenomena she initially did not know what to do. After a prayer she addressed the little one: "Sister Mary of Jesus Crucified, if Jesus wishes it, come down through obedience without falling or hurting yourself." At the simple word obedience, the ecstatic descended in fact "with the radiant face" and perfect modesty, stopping on some of the branches to sing Love. "Hardly was she on the ground," noted a witness, "and as if to make amends to our mother and sisters for our anxiety in looking for her and in seeing her perched up so high, she embraced us with a sort of enthusiasm and affection impossible to express." Eight ecstatic levitations were documented: Beginning in 1873 on June 22, July 9, 19,25, 27, 31, August 3, 1873 and finally on July 5, 1874. "How did you manage to climb like that?" the mother prioress asked her. And she replied: "The Lamb held out His hands to me:" Some of the nuns wanted to make sure of this so they spied on her. One day a lay sister who was working in the garden was witness to the flight: "She had taken hold of the tip of a little branch that a bird would have bent; and from there, in an instant, she had been lifted on high." On July 5, perched on the lime tree, she addressed the mother prioress: "I was on that one there and I came up here. Look, see, my alpargates (a kind of soft slipper) are still there." On July 19, 1873, when the order was given for her to descend, she hesitated a moment. She begged to be allowed more time with the Lamb. "No," insisted the prioress, "through obedience, come down." She obeyed, but the shadow of hesitation had been fatal: the vision had disappeared. "The Lamb went away." Sighed the sister, "He left me alone to come down." In fact, because of her hesitance in obedience it was with effort that she got down to the ground and for four days of grief she expiated that unhappy moment. On July 25, the levitation lasted from four to seven o'clock in the evening; on July 31, it lasted from the end of recreation, which follows supper in the evening, until nine o'clock. This phenomenon occurred only at the Carmel of Pau. In a letter dated February 14, 1927, Father Buzy, the Carmelite´s biographer, wrote the following statement to bishop Oliver Leroy: "Sister Mary used to raise herself to the top of the trees by the tips of the branches: she would take her scapular in one hand, and with the other the end of a small branch next to the leaves, and after a few moments she would glide along the outside edge of the tree to its top. Once up there, she would remain holding on to branches normally too weak to bear a person of her weight. " The following are some depositions given by witnesses at process: "Sister E., now deceased, told me that one day when she happened to be in the garden with the servant of God, the latter said to her: "Turn around." She had hardly turn her head when looking back again, she saw the little one already seated on the top of the lime tree, on a little branch, balancing herself like a bird and singing divine love. Another person declared: "Once I saw her in ecstasy at the top of the lime tree, seated at the tip of the highest branch, which, normally would never have been able to support her. Her face was resplendent! I saw her come down from the tree like a bird, from branch to branch, with great nimbleness and modesty." At about nine o'clock blood flowed from the crown of thorns all around her head. I can solemnly attest that I saw blood coming from the holes of the thorns, one of which, in the center of her forehead, opened before me, and blood gushed from it. While I was washing it, it closed again, leaving her forehead without any mark, except the traces of blood. Her feet were white; one would have said the feet of a corpse, and the toes were stretched like those of one crucified. The wounds on the upper part bled, as did the wound on her side. After three hours she was completely herself again, experiencing only a little weakness. I told her to get up, which she did by herself, and that evening she came to supper with the community." In the notes of the Carmel of Pau, we read that on Thursday, February 27, 1868: "She could not get up, she was suffering so much in her hands and feet. We took her to the infirmary. All that evening when passing near there, we would smell a strong sweet fragrance, but we could not detect its source. The novice´s veils and mantle also had a pleasant odor. The night was a bad one for her and the next morning blood began to flow from her feet and hands. The crown of thorns bled profusely at two different times, then the wound in her side, all with unspeakable pain. At noon all the bleeding stopped but the wounds remained open and became deeper each day, which prevented her from walking or putting her feet on the floor, for forty days. She could hardly bear any contact with the linens used to wrap her wounds, especially on Friday and Saturday. From that day until the following Friday, the wounds only oozed, but on Thursday of each week, a large pimple formed, black likea nail, which grew in size until Friday, then at the hour she designated in advance, this sort of blister fell off and the blood flowed; afterward the wound closed until the following week." "The hands were swollen on the palm and the wounds were open;but all around the edge of the wounds there was a little coagulated blood, no doubt because this wound had begun to open several days before. On the inside of the hand there was a sort of button, forming the head of the nail. The flesh of the palm seemed to have been separated violently; it was torn, if I may thus express it, on the inside there were no tears, only the head of the nail was visible. The feet were similarly pierced through and through. The wounds were fresh, the flesh torn perhaps more than on the hands. One of the perforations was exactly in the middle of the sole of the foot, and there it ended with a quite newly formed small round hole, just as if the point of a sharp nail had been driven through it and then pulled out. It was the same with the other foot." "About five thirty, all around the front of her head was bleeding; she had a sort of crown of little button shaped holes, some of which were still open as we looked on. During this time she wiped the blood from them. She got up right after that and all traces disappeared." Holy Week was frightful. Every part of her was bleeding: head, heart, hands and feet. During the course of her life she came to relive and act out certain scenes of the passion. She became the crucified spouse of a crucified God! Identified with her Spouse to the very details of Good Friday! "When she was in the state, she could have been called an 'ecce homo,' " declared Mother Honorine, in 1867 at the Capelette. "She was groaning and she trembled in her whole body. It was heart rending to see her like that. She often repeated these words: "My God, do not abandon me; my God I offer it to You! Pardon, my God, pardon!" At a quarter past two in the afternoon she began a painful agony; we were all around her. Her legs were stiff, her feet down and crossed one over the other; her arms extended in the form of the cross, were supported by two of the sisters; her chest was distended, she even emitted a few sighs, as though she were breathing forth her soul…After three and a half hours, she had a little relief and spoke again to those "children" (angels) saying to them: "Have pity on me, call me today." She also experienced transports of desire and love: "Call me so that I may leave this earth!" Then she was heard to say: "Fiat, Jesus!" We then had the impression that the crucified one was descending from the cross and from Calvary in order to prepare for the Easter joys. "Don Belloni, confessor of the stigmatist at Bethlehem, asserted that when holding one of her hands against the light, the flesh appeared transparent at the place of the stigmata. Besides being deeply grounded in humility, in her ignorance she did not realize that the stigmata was a privileged grace from God; she looked upon it as an illness and begged God and Blessed Virgin to take from her what she called "the wretched marks." According to her prediction, the wounds reopened the following Lent, at the Carmel of Pau. They caused atrocious suffering and flowing of the blood. That was renewed every Friday during the Lent of 1868.The Carmelite nuns were admitted to see the prodigy; and the superior of the Carmel, Father Guilly entered the enclosure. He verified the phenomena, he put his finger on one of the wounds: at this contact the novice´s entire body shuddered. On Holy Saturday the Stigmata disappeared. The wounds appeared again at Mangalore. On November 20, 1871, the eve of her profession, the little one confided to the mistress of novices: "If I tell you something will you keep my secret?" - "Yes." - "Look, this illness that I fear so much has returned." And she showed her her swollen hands and feet. The day after her profession the stigmata bled profusely. Frightened, the sister earnestly begged God to cure her. This time again she was heard. For more than four years she experienced nothing. Mariam's devotion to the Holy Spirit was not common in her time. And yet her spiritual journey seemed to be guided by the Spirit in unprecedented ways. Inspired by having received a special prayer to the Holy Spirit during one of her ecstatic experiences, she was convinced that devotion to the Holy Spirit, who was then commonly known as the Paraclete, was needed by the whole Church. She even sent a petition to Pope Pius IX asking him to cultivate a greater devotion within the Church to the Holy Spirit. No one knows what the pope thought of this at the time, but 20 years later Pope Leo XIII published an encyclical about devotion to the Paraclete. "The world and religious communities are seeking novelties in devotions, and they are neglecting true devotion to the Paraclete. That is why there is error and disunion, and why there is no peace or light. They do not invoke light as it should be invoked, and it is this light that gives knowledge of truth. It is neglected even in seminaries . . . .
Every person in the world that will invoke the Holy Spirit and have devotion to Him will not die in error." Bethlehem whom she was helping to build the new Carmelite convent. It was clear that her health had been compromised for quite some time and now her arm would not heal but rather swelled with gangrene, and the infection spread to her lungs and respiratory tract. She knew she was dying. Through her suffering she renewed her vow as a victim for the Church and for her adopted country France. On August 26, 1878 she felt as if she were suffocating and died soon after murmuring, “My Jesus, mercy.” It was ten minutes past five in the morning. Like her Jesus she died at the age of 33. An Arab mystic and stigmatic from the holy land! How wonderful! Thanks be to God! -It is remarkable how the stigmata and the wounds given to the mystics often can disappear so quickly. I have read this is the lives of a good number of other mystics too. Blessed Mariam, please pray for us! It is interesting also that while the mystics often share some similar mystical graces, however at the same time each mystic is unique in their individual spiritual lives and devotion, and especially the visions or ecstasies that they receive are always unique to each of them, even if, for example, the vision is of the same event, like the Passion of Jesus. Also, some of the mystical graces that the mystics receive are unique only to them. Like the numerous occasions where a rose came out through the chest of the Servant of God, Maria Esperanza, or the "globe-sun" given to Blessed Anna-Maria Taigi. These mystical graces were unique and only occured to them. Thanks for this post. I've not seen any other website post so many details about her as you did. I had also read that Blessed Mariam did struggle with demonic possession about some thirty days which may be a part of her victimhood. Do you have any details of it since it was not mentioned in your post? I want to know how she emerged victorious over it. Thanks for your kind comment---I am really glad to hear that you enjoyed this article on Blessed Mariam Baourardy, “the Little Arab". And you are right, Bl. Mariam is certainly a very special being-- she was truly an extraordinary mystic, and an excellent "bridge" between Catholics and Muslims, and really Christians and Arabs in general. Well, thanks again and may God bless you and your loved ones. -Blessed Mariam Baouardy, pray for us! Awesome!!! Blessed be God in His Angels and in His Saints! Where did you get these wonderful photos, and how can I obtain permission to share them with my Carmelite community? Thanks for your kind comments. I am really glad to hear that you enjoyed this article. 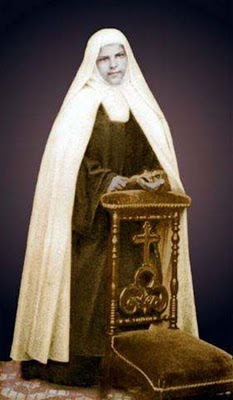 Blessed Blessed Mariam Baouardy is definitely one of the many precious spiritual "jewels" of the Carmelite Order. If I recall most of the photos came from a currently out of print book on Blessed Mariam---but anyway feel free to print out this article with the accompanying photos: you can do so by clicking on the green "print" button at the bottom of the article. Blessed Mariam Baouardy, pray for us! The article refers several times to 'Palestine'. But was not this ancient name revived only after World War I? Was it in use during the lifetime of the Blessed Mariam? I'm not sure. It was the author of the source book that I used that made the "Palestine" reference: "Mariam, the Little Arab - The life of Bl. Mary of Jesus Crucified, translated from the original French work of Fr. Amadee Brunot. Hi Glenn --- Thanks for your reply. On the day of Mariam Baouardy's beatification, November 14, 1983, John Paul II addressed a thousand-word talk about her to the assembled pilgrims. He did not use the words "Palestine" or "Palestinian". He mentions the Holy Land several times and also the Near East, and at one point refers to Mariam as the "little Arab" (in quotation marks in the printed text). I raise the matter because the name "Palestine" is so politically charged today that the question of whether or not to use it with regard to Mariam is a delicate one. I doubt that it would have been so used in her lifetime. Mariam does remind us that there have always been Arab Christians and reminds us also perhaps that the persecution of Christians in the Islamic world (if not necessarily in the Palestinian territories) has become particularly severe in recent decades. It might be more important that Mariam be remembered as being Arab than as "Palestinian". Thanks KC. You raise a very important point--something I personally did not consider. Thank you for this article. I was wondering about the icon you posted at the end. Why is there a burning bush? Please "LittleArab" pray for peace between the Muslims and Christians. And for our Church. Thank you. I AM NOW SO HONOURED AND BLESSED TO KNOW THAT I DO HOLD THE MOST HOLY RELIC OF THE BLESSED MARIAM. THE FATHER SUPERIOR BEFORE HE DIED FROM CARMEL IN MALTA GAVE ME A BIG THECA SEALED WITH A WAX SEAL AT THE BACK AND IN THE THECA THERE IS A CLOTH STAINED WITH DARK RED BROWNISH LIQUID AND ON THE LINEN THERE IS AN INSCRIPTION SAYING "EX VESTE SANGUINE IMBUTA MARIAN A JESU CRUC" STAINED BY HER STIGMATA BLOOD! WOW I AM SO BLESSED!!!! Glenn thank you for sharing the wonderful life of blessed Mariam Baouardy with us . she was born in Ibillin village my beloved village , and we are so proud of her .we pray that she will be declared a saint by the church in the near future . may her prayers be with us. The little Arab's family heritage traces back to the Palestinian Christians of ancient time. I find this a great honor since they were the first followers of Christ back in his day. Maybe we should include her intercession in our prayers and fasting for peace in Syria. I was drawn to this lovely lady, Mariam of the Crucified Jesus, today, in answer to a plague of atheistic recurring doubts. Thank you, Glenn, for having this site to catch my fall! And thank you Mariam for lifting me back up again. I pray that Jesus may increase your faith and continue to draw you ever closer to Himself. And Blessed Mariam will be canonized by Pope Francis this Sunday, May 17, 2015! Praise God! Thank you for the beautiful article. I read it a couple years ago but now it seems even more wonderful. I named my 2nd daughter Mariam Grace. what a blessing for our times ! Mariam intercedes for the conversion of good-willed muslims! "..Mariam is certainly a very special being-- she was truly an extraordinary mystic, and an excellent "bridge" between Catholics and Muslims -"
She almost had her throat slit by a muslim who tried to force her to convert to islam-what bridge is that? Thank you Glenn for this nice article on St. Mariam Jesus Crucified. I wanted to learn more about her after her Canonization. As a result, St. Mariam Jesus Crucified led me to this website and to the amazing stories of other Mystics and Saints. Thank you! Thanks Anonymous for your kind comment. I am really very happy to hear that you are enjoying this website! I saw that the Pope will celebrate a Holy Mass and Canonizations on October 18. I knew about the Marital Canonization of the Martins and of the other dual canonizations of the children of Fatima, but just saw St. Mariam of Jesus Crucified for the first time. I'm entirely charmed by her. To have such love for Jesus! I've spent the entire evening watching YouTube videos and reading of her life. Her parents were holy, too, may they rest with God in whom they trusted to hear and answer their requests through the intercession of Our Lady and her husband, St. Joseph. I'm only somewhat familiar with the canonization process, but I understand that (1) great care is taken to verify the intercessionary miracle, so this isn't a political stunt; and (2) the Vatican doesn't hold back just because the politics aren't right in human judgement. The time is now because it is God's time. He's getting our attention through St. Mariam of Jesus Crucified. Blessed be the God of Ages! Weren't one of her parents Lebanese? Interesting that all of her levitations were involved with ascending a tree. Her levitations lasted for hours at times, too bad nobody took any pictures of her up the tree. Apparently no pictures of her stigmata either. This story is amazing! St. Mariam pray for us! 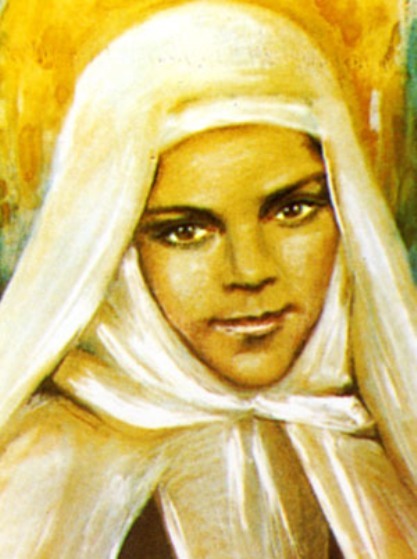 Does anyone know what St. Mariam Baouardy is Patron Saint of? For all that the venerable Saint suffered in her various bodily and emotional torture, wouldn't it be apt to address her as The Patron Saint of Sinners? I had the privilege of visiting the chapel with her relics in the Holy Land. This makes it even more special, knowing the graces, sacrifices and gifts of St.Mariam. I looked thi ssaint up because I just read about her possession for 40 days by Satan. I am wondering why it is not mentioned here.